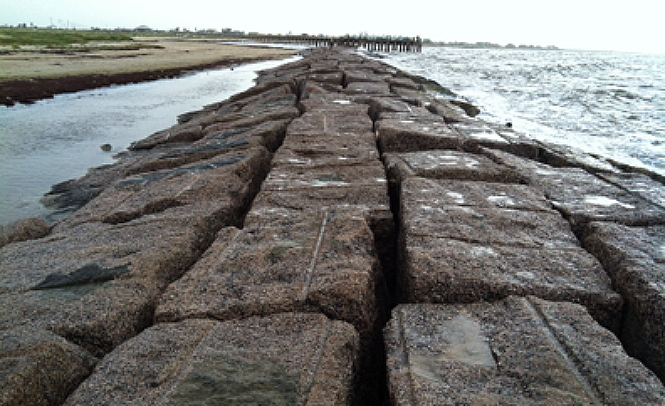 Aqua Strategies staff member Tim Osting is leading a team to recommend geometric properties of a new jetty to manage sedimentation at the river mouth. The project involves on-site assessment, data accumulation, and development of a hydrodynamic model. The ultimate goal of the project is to prevent future closure of the San Bernard River mouth from littoral sediment sourced from the mouth of the near-by Brazos River. Currently, the mouth of the San Bernard River is closed and cut off from the Gulf of Mexico for the second time in the last decade. Mr. Osting is leading the assessment team responsible for recommending an appropriate jetty configuration to keep the San Bernard River mouth open.